The Vitrine Gallery, situated in Bermondsey Square, is run by two artists Alys Williams and Rennard Milner and the space is entirely self-contained. It's situated along one side of the square as a shop front, allowing them to work full-time on their art and to run the space showcasing new artists. They are currently looking to focus on artists from outside the London scene and bring a fresh perspective into the mix. Also based in the square is the independent Shortwave Cinema and soon to come is an independent bookshop, making this a thriving place for the arts as they aim to bring together the creative elements of the square for events over the summer encompassing film, spoken word and visual arts. 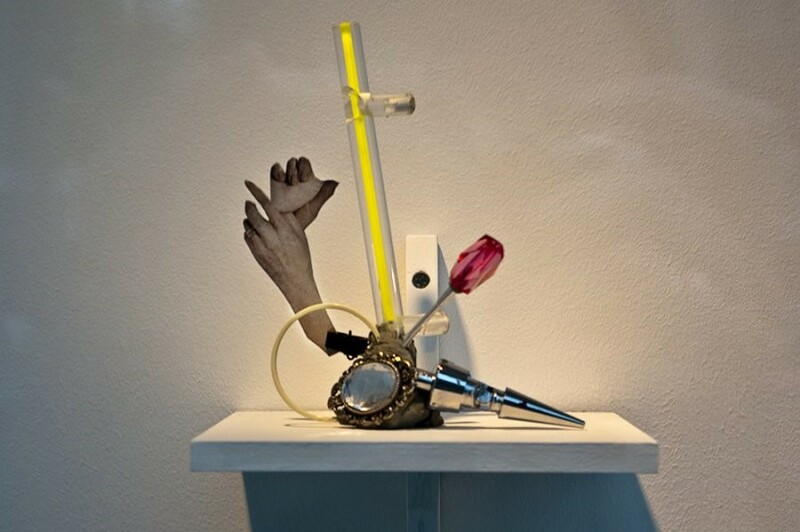 Samantha Donnelly is the first artist to exhibit at Vitrine Gallery. Using elements of collage and sculpture, Samantha works with found objects creating delicate and surreal ‘sketches’. These three-dimensional collages are an aesthetic treat. Having exhibited alongside Rachael Whiteread and Cornelia Parker in Leeds as part of 2009’s group show Perhaps Everything, Perhaps Nothing and having her first solo show Silver Sheer at Liverpool’s Ceri Hand Gallery in the same year, Compendium marks Samantha Donnelly’s first solo London show. Dazed Digital headed down to have a look and spoke to the artist about her work to date. Dazed Digital: Your first exhibition was influenced by Saint Theresa of Àvila , what inspired you while creating the work for Compendium? Samantha Donnelly: The work in that exhibition was formulated around a BBC television broadcast of Simon Schama, called The Power of Art, where he re-narrated the sculptures of Bernini for a TV audience, using cinematography and the codes and conventions of editing to develop a visual story about inert sculptures. This work pre dates that exhibition, but has the same relation of re-writing a narrative using collage, and quotes from it – using senses of movement, bricollage, editing – what is unique here is that the project gathers part of a larger series in one place. DD: You call your sculptures sketches, how do you define the difference between a sculpture and a sketch in terms of your work? Samantha Donnelly: The term sketch was used as initially they were preparatory objects made to keep an alive active practice – like the way a photographer might take their iphone to gigs and always be viewing and seeing things in a different way, in addition to their other studio work. They have a sense of being ideas caught in a temporary way, which may expand in other work. Sketch's are generally two dimensional drawings on paper, and this fits with the relief sense of the work, as the collage is front facing and they are hung on shelves, so that you can't walk around them as you might traditional sculpture. DD: There is something very feminine and delicate about your work, is that something that you intended? Samantha Donnelly: I see them as going against a historic idea of monumentalism which sculpture addresses, which is traditionally seen as masculine. DD: How did you begin to develop the way you use collage? Samantha Donnelly: The collage elements came in as they have a temporality – the today’s news is tomorrows chip wrapper type of thing – and in a digital age there is a huge sense of flux. So the collages signify a human presence and refer to the figurative sculpture of the past, and the human condition. DD: What is the significance of the objects you use in your work? How do you begin to select the found items? Samantha Donnelly: Some of the objects are mine, gathered from travels or collected from junk shops. Some of the stuff comes from £1 shops, which sell copies of the originals for a knocked down price. There is an aspirational sense to the work, things that you like to run your hands across – designer cloth, beautiful embossed leather, shiny surfaces. DD: Tell me about the series you are working on. Do you think it will continue in the same vein you have been working in? How do you see it developing? Samantha Donnelly: These are the last sketches for now. They are growing in to larger and relational installations, where the connections present in those discreet pieces are translated into spatial relationships. I still see colour and collage playing a part but bouncing off each other on a larger scale. DD: Perhaps Nothing, Perhaps Something the group show sounds like an interesting project how did that come about? Samantha Donnelly: I had worked with the gallery in the past and was invited to develop some of these small scale pieces. The idea was that there was something and nothing to the work, that it was almost there and not at the same time. In this way it questioned the idea of the object.